Visual Data Media Services is an innovative content preparation, localization, and post-production company with branches in London and Los Angeles that has carved out an enviably successful position in a highly competitive field by matching their technical capabilities to the needs of a fast-changing market in a careful, incremental way. The company has been providing its services successfully since 1995, but in 2017 it was clear that a major infrastructure improvement was needed. “We started to see a huge increase in 4K and UHD projects, and our old system just couldn’t keep up,” explains Ken Spickler, Visual Data Director of Engineering. “Whenever we had to process uncompressed 4K files, the existing NAS infrastructure was just too slow to handle more than one job at a time.” The team got the work out, but managing around the bottleneck was a major problem, so Visual Data looked for a solution that could double capacity and deliver the performance to support multiple 4K and UHD operations at the same time. 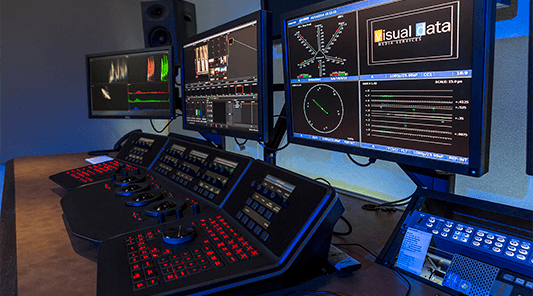 “Just as important to us as upgrading to 4K workflow was giving us a way to take advantage of a major new opportunity to solve the problem of re-mastering existing content faster and more efficiently,” Spear says. During the 1990s and early 2000s, when the first non-linear editing systems were used for episodic TV and direct-to-video motion pictures, work was shot on film initially, but production teams edited and finished on standard-definition video, eliminating the need to create a cut negative of the final version. “That new workflow made everything faster and less expensive,” Spear explains, “but it created a major nightmare when content owners wanted to distribute their SD content in HD or 4K.” With no cut negative to scan, the only way to get old features to 4K is to perform a match-back—scanning the original dailies and eye matching against the finished SD element in order to conform the content. In late 2017, after more than a year of development, Visual Data was ready to offer a new match-back service leveraging image-matching software that uses AI to automate the process. It’s called Matchmaker. “We are starting to revolutionize the restoration process of library and archived content,” Spear said. “What used to take many weeks now gets done in a few hours—and the process is much more economical. But to make it work, we needed a storage and processing environment to take advantage of our new capability.” The plan was to buy high-performance storage to support both our traditional core business and our new Matchmaker business. The question was, which technology to use. Quantum’s high-performance storage and file system supports multiple simultaneous 4K and UHD scanning and mastering operations, simplifying workflow and reducing the time to complete projects. Ability to scale performance and capacity independently gives clients the ability to grow their systems to meet future needs while avoiding forklift upgrades. Support for both Fibre Channel SAN and LAN connections allows customers to create an optimal balance between performance and cost. System provides ease of management to allow a six-fold increase in capacity without adding staff, and security controls to meet the most stringent studio audit requirements. Expert, responsive service from Quantum and its partner, Diversified, ensures smooth ongoing operations. Lowest per-TB cost and flexible support for the cloud provides a system designed to stay economical into the future. Visual Data Media Services provides a full range of content preparation, localization, post-production and distribution services for television, feature film, and new media clients, including restoration, captioning, localization, transcoding, and mastering into Digital Cinema Package (DCP) and Interoperable Media Format (IMF). The company has also launched an innovative media restoration and upgrade project that uses image recognition software to slash the time needed to convert existing SD content into 4K or UHD programming. With offices in Los Angeles and London, Visual Data serves an international market that includes premier suppliers to broadcast, theatrical, on-demand, and over-the-top platforms. If you can imagine it, we can engineer it. What we do is art. Diversified offers artfully designed and comprehensive managed network and media technology solutions to serve a wide range of diverse markets. If your company can visualize the media integration scenario to perfectly fit your needs, odds are, we can create that masterpiece.